In 1999, Patrick Jouin met Alain Ducasse with whom he collaborated designing many restaurants such as the Alain Ducasse au “Plaza Athénée”, “Be boulangerie-epicerie”, in Paris, and the “Mix New York” restaurant. Those projects gave a lot of recognition to Jouin’s designs. To achieve his goals within the design industry, Jouin intends to revise the industrial culture selecting mass-industrial machinery forms - blast furnaces, turbines, chimney stacks, moulds, forges - and integrating them into the world of luxury. In 2011 Patrick Jouin won the “Compasso d’Oro” ADI Award with the Pasta Pot designed for Alessi. 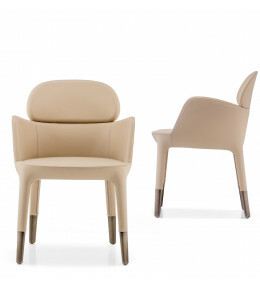 Elegant Ester dining armchairs in genuine leather or fabric with aluminium or bronze leg finish.